I have more than just birthday cake ideas, check out more homemade recipe links at the end of the page. I have some wonderful homemade cake recipes from scratch that everyone will RAVE about. Colorful and moist, these cakes build wonderful memories. Kids LOVE it and "big kids too." You are going to learn how to make a cake that will knock your family and friends SOCKS OFF. 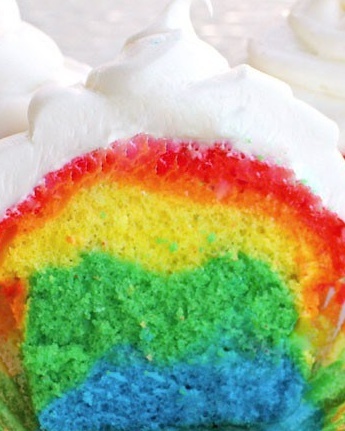 I am giving you my favorite rainbow cake recipe. So don't go out and buy that birthday cake, make it - and you never know, you may become famous for this cake. The secret is your guests don't know that the cake is "rainbow colored" and are shocked when they cut into it. I have also used a homemade pound cake, and colored the batter with gel food coloring (about 7 different colors,) and baked it it a tube pan. What a hit. Make a glaze and use some fun sprinkles on top if you wish. Not just a great birthday cake idea; I have since used this recipe to make a "Santa Cake" for Christmas, using plain batter, red, and green. You can use different colors for different holidays...... Red, White, and Blue is great for the 4th of July. FYI: When you color your batter, you can just "plop" it in the pan. It will marble on it's own while baking. You will find the paste or gel food coloring at Wal-Mart or Michael's. It is made by Wilton, so any store in your area that carries Wilton baking supplies would be worth checking into. Wilton also makes a powdered food coloring that is good for making intense or darker colors icing, too. Here are the gel food coloring colors you will need, or want to have on hand: red, orange, yellow, greens, purple and blue. PREHEAT oven to 350 degrees. Grease and flour a 9x13 inch pan, three 8" cake pans, or two 9" pans. Place parchment paper in the bottom. Note: Trace the cake pan and then cut the parchment paper into circles. Line muffin tins (makes approximately 15). Measure sifted flour, baking powder, and salt and sift together three times. IMPORTANT to follow these steps. In a mixing bowl, beat egg whites until foamy. Add 1/2 cup sugar gradually, and continue beating only until meringue will hold up in soft peaks and beat thoroughly into the cake batter. Divide the cake batter into six separate bowls. Use a toothpick to scoop a dab of paste food coloring into one bowl of batter and stir; add more food coloring, if necessary, to reach the desired shade. Repeat with the remaining colors and bowls of batter. If you make cup cakes, just pour about 2 cups of the batter into 6 different bowls and add the gel coloring.. blend together and dump a tablespoon of each color into the cups. Scoop spoonfuls of batter into the prepared pans, alternating the colors. Bake for 20 to 24 minutes for the two 9" or or three 8" pans. It will take 25 to 30 minutes for the 9x13 inch pan. Cool cake in pan 10 minutes, then remove from pan and transfer to a wire rack to finish cooling. I have more than just birthday cake ideas, please check out more recipes below.